Gallery director Virginia Miller was one of five speakers in a symposium on “East/West: Visually Speaking” the first group exhibition of contemporary Chinese art curated from the artists rather than from private collections. 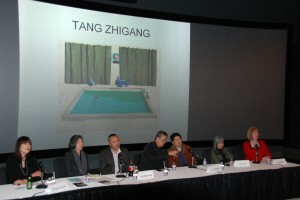 Being held at the Paul and Lulu Hilliard University Art Museum, University of Louisiana at Lafayette from Jan. 22 through May 1st, the exhibition was coordinated by Miller, who has held three major exhibitions of Chinese contemporary works at ArtSpace/Virginia Miller Galleries. The exhibition was curated over a two-year period by Dr. Lee Gray, who moderated the symposium. Also speaking were two of the show’s artists, Ma Baozhong and Luo Weiguo, along with the critic, curator and author Lilly Wei. Events held in conjunction with the exhibition included a celebration of the Chinese New Year featuring acrobatic lion dancers. For more information on the exhibition or to order a catalog, contact the museum online here.